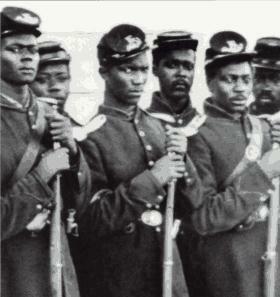 Black Union Army soldiers like Spottswood Rice helped turn the tide in the Civil War. The Hero Father. In the face of a family court system that is stacked against him, he fights a long, hard battle to remain a meaningful part of the lives of the children who love and need him. The press rarely, if ever, talks about the Hero Father. They’d rather vilify “deadbeat dads,” real or imagined. But even the best among us could learn much from a Hero Father of a different era—a former slave named Spottswood Rice. Unfortunately, there are those in our movement who fall into the same thinking of those whom Douglass criticizes. Let us be clear–the fight for fairness in family law is a fight against entrenched, well-financed interests who will not be moved unless they are pushed. And the only way to effectively push them is the Fathers and Families way–by building a strong, well-funded national organization that can wage a determined struggle for our children and the loving bonds we share with them. Fathers and Families fights for the modern Hero Father, the modern Spottswood Rice. Please give in honor of Hero Father Spottswood Rice or the Hero Father in your life. Please write in whose honor your gift is on the memo line of your check or, when giving electronically, please use the “Honor” screen after you submit your gift. We’ve accomplished much, but there is far more left to do–please give. P.S. Time is short–there are only a few days left for you to put your check in the mail or give electronically. Please give today!